I try to be on top of online trends and new technology. So I’m a little ashamed to say that I just registered with facebook yesterday. Even worse, I only signed up for MySpace a few weeks ago. In my opinion, both these sites aim to accomplish the same task, but facebook does it much better. Facebook imported my contacts from Gmail and figured out that some of them were already facebook’ers. With my permission, it send friend requests to a couple dozen people. Within minutes, I had friends! Professionals surely know about LinkedIn. Perhaps you’re really hip and even understand MySpace. Now there’s a new player on the block: Meet Job Pros. 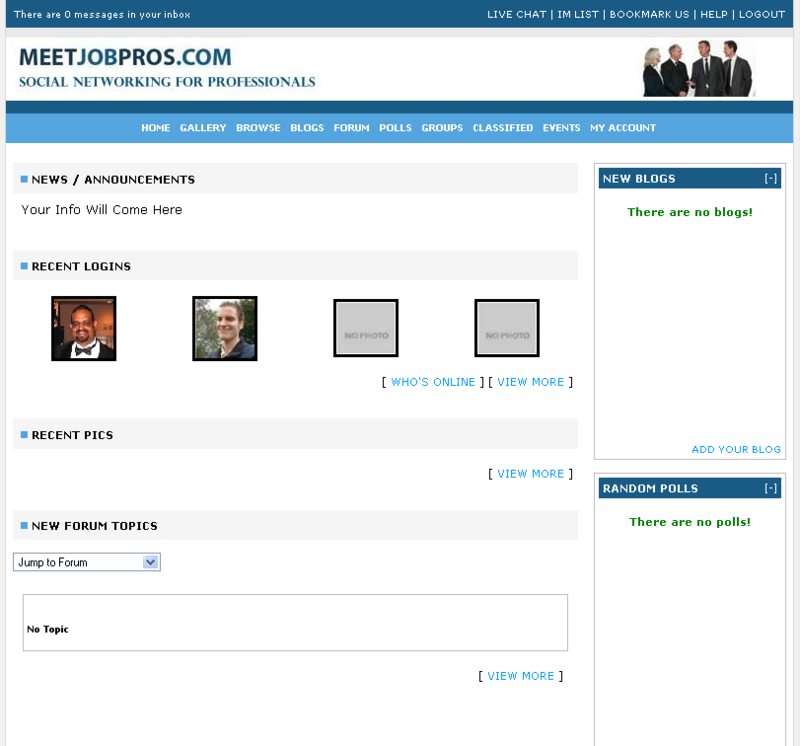 The interesting thing about Meet Job Pros (MJP) is that it seems to merge some of the key features of MySpace and LinkedIn. It’s kind of “MySpace with a professional twist.” But understand that not many people have registered yet, so some screens are a little blank. I recently got really behind on my podcast listening. I just caught up, and in the process, I listened to a great podcast by Steve Pavlina. In this podcast, Steve talks about a method of achieving goals faster. Instead of taking the typical approach of identifying the steps to a goal, Steve urges that we think about the symptoms of actually reaching the goal. I’m a big advocate of doing simple things to help the bigger picture. In many endeavors, a lot of tiny steps can produce a huge result. Careers are like this. A successful career is usually made up of many small steps. True, there are large ones as well. However, the everyday things usually contribute a ton to the whole. Thus, here’s a great list of 15 easy things you can do to help your career. This is Part 3 in a series of posts on getting things done. “GTD: My View” covers how I implement GTD, specifically focusing on being a student. Be sure to check out Part 1 and Part 2. This is Part 2 in a series of posts on getting things done. “GTD: My View” covers how I implement GTD, specifically focusing on being a student. Be sure to check out Part 1. It’s no secret that I’m a law student. Part of my goal in blogging is to collaborate with other students on ways to be more productive. That’s one key theme of Legal Andrew. What is a school assignment? This is Part 1 in a series of posts on getting things done. “GTD: My View” covers how I implement GTD, specifically focusing on being a student. I love getting reader feedback! In fact, I’m writing this series specifically because several of you have asked about my personal system for GTD. Thank you, Andrew L., for the most recent request! More importantly, you guys are interested in ideas to tailor GTD to the needs of students. Thus, here’s my attempt to help out. Statistics are a key part of any type of venture. You need to know what’s happening, how your target demographic is responding, and what areas you can improve. The same applies to blogging. I’ve had several readers ask what statistics I use here at Legal Andrew. The short answer is “any and all.” Well, I’ve tried many solutions. But now I’ve finally found three I love. Am I a White Supremacist for Discussing Politics? If you haven’t read the work of Penelope Trunk, you definitely should check out her blog. She now even has a column on Yahoo! Finance. Lawyers Should Use Buzz Marketing Too! How do you spread the word about your law firm? Do you take out yellow page ads? Maybe you’ve started blogging. What about buzz marketing? Yellow pages are stagnant. Web sites only provide information. Buzz marketing interacts with people and society. It’s today’s marketing tool.